Economies of scale is the competitive advantage that large entities have over smaller ones. The larger the business, non-profit, or government, the lower its per-unit costs. It can spread fixed costs, like administration, over more units of production. There are two main types of economies of scale: internal and external. Internal economies are controllable by management because they are internal to the company. External economies depend upon external factors. These factors include the industry, geographic location, or government. Internal economies are a result of the sheer size of the company. It doesn't matter what industry it's in or market it sells to. For example, large companies have the ability to buy in bulk. This lowers the cost per unit of the materials they need to make their products. They can use the savings to increase profits. Or, they can pass the savings to consumers and compete on price. 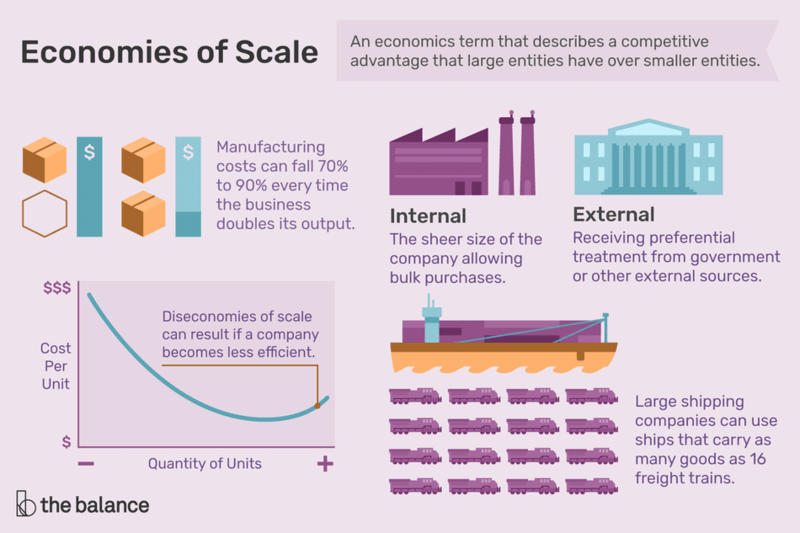 There are five main types of internal economies of scale. Technical economies of scale result from efficiencies in the production process itself. Manufacturing costs fall 70-90 percent every time the business doubles its output. Larger companies can take advantage of more efficient equipment. For example, data mining software allows the firm to target profitable market niches. Large shipping companies cut costs by using super-tankers. They can use post-Panamax ships that carry as many as 16 trains. Finally, large companies achieve technical economies of scale because they learn by doing. They’re far ahead of their smaller competition on the learning curve. Monopsony power is when a company buys so much of a product that it can reduce its per unit costs. For example, Wal-Mart's "everyday low prices" are due to its huge buying power. Managerial economies of scale occur when large firms can afford specialists. They more effectively manage particular areas of the company. For example, a seasoned sales executive has the skill and experience to get the big orders. They demand a high salary, but they're worth it. Financial economies of scale means the company has cheaper access to capital. A larger company can get funded from the stock market with an initial public offering. Big firms have higher credit ratings. As a result, they benefit from lower interest rates on their bonds. Network economies of scale occur primarily in online businesses. It costs almost nothing to support each additional customer with existing infrastructure. So, any revenue from the new customer is all profit for the business. A great example is eBay. A company has external economies of scale if its size creates preferential treatment. That's most often occurs with governments. For example, a state often reduces taxes to attract the companies that provide the most jobs. Big real estate developers convince cities to build roads to support their buildings. This saves the developers from paying those costs. Large companies can also take advantage of joint research with universities. This lowers research expenses for these companies. Small companies don't have the leverage to benefit from external economies of scale. But they can band together. They can cluster similar businesses in a small area. That allows them to take advantage of geographic economies of scale . For example, artist lofts, galleries, and restaurants benefit by being together in a downtown art district. Sometimes a company chases economies of scale so much that it becomes too large. This is called a diseconomy of scale. For example, it might take longer to make decisions, making the company less flexible. Miscommunication could occur, especially if the company becomes global. Acquiring new companies could result in a clash of corporate cultures. This will slow progress if they don't learn to manage cultural diversity. You don't have to be a corporation to benefit from economies of scale. Think of it like being able to buy in bulk if you have a larger family. Each box of detergent costs less per wash because you can buy it in bulk. The manufacturer saves on packaging and distribution. It then passes the savings onto you. Bulk is also cheaper for you because you make fewer trips to the store. Economies of scope occur when a company branches out into multiple product lines. They benefit by combining complementary business functions, product lines, or manufacturing processes. For example, most newspapers diversified into similar product lines, such as magazines and online news. This diversified their revenue away from declining newspaper sales. Their advertising sales teams could sell ads in all three product lines. It's easy to confuse economies of scale with economies of scope, because they are both found in larger companies. Just remember that economies of scale apply to one product line. Economies of scope refer to combining efficiencies from many product lines.